The Horse Stable toilet trailer has been vinyl wrapped with rustic wooden effect finish, designed to give the impression of a Horse Stable. This bespoke Horse Stable toilet trailer is the largest in the themed toilet range combining 2 females toilets, one male toilet and 2 urinals. 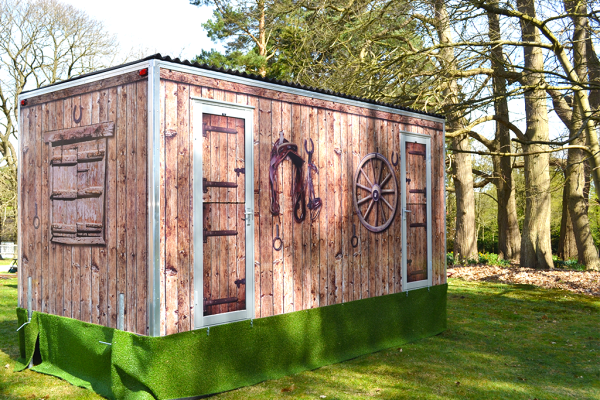 The Horse Stable toilet trailer unit has been finished with co-ordinating images, including a wooden wheel and equestrian tack to reflect the theme. This unit is suitable for up to 175 guests over an approximate time of 8 hour event depending on the usage. The Horse Stable toilet trailer forms part of our themed toilet trailer range which consists of the Gypsy Caravan, Beach Hut, Potting Shed and the Shepherds Hut. The Horse Stable is ideal for an outdoor bespoke wedding, party or event that requires a toilet trailer to blend into the surroundings. The Horse Stable toilet trailer is complimented with porcelain loo and sink, high end wooden cabinets, a full length mirror in the ladies and spot lighting as well as blue detailing led lights. Externally this unit also has a grass skirt, metal steps with discrete LED lighting to prevent slips and trips and further compliment the theme. Our experienced sales team will be able to answer any other questions you may have on this unit. Unique to Site Event and built by our sister company Site Build they are the latest talking point in Toilet Hire. This toilet trailer will arrive with a uniformed driver via a 4×4 vehicle or 3.5 tonne transit van and will need, adequate access and turning area to facilitate sighting. A firm level area will be required with a power source this can be via an 13 amp extension lead. Power is required to run and test the unit on delivery ready for your event. Your driver will set up this toilet trailer ready for use with toilet tissue, hand towels, and high end “Scottish fine soaps”.